I can’t escape the cycle of kindness. 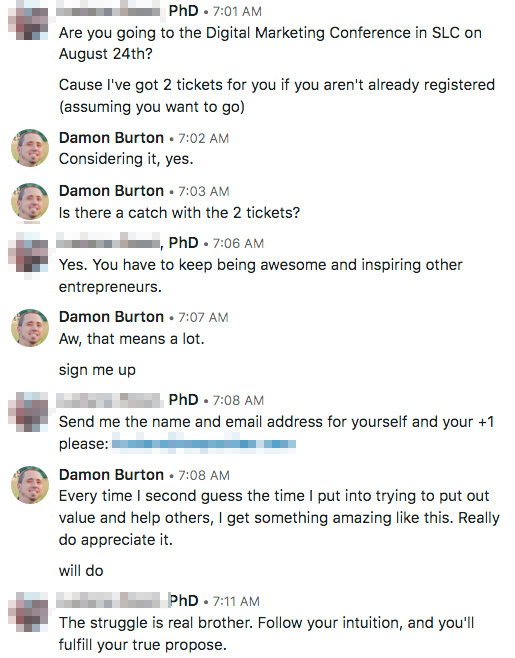 Every time I second guess the time I put into trying to put out value and help others, something amazing happens (attached pic). It takes massive amounts of time. When you read posts of someone you follow, that single paragraph likely took an hour to write. Then a day to revise. Then two days to sit on. You’re giving away knowledge that took you decades to acquire. A lot of trial an error. And in an instant, it’s there for the world to read. To save them decades of trying to learn. To save them trial and error. To help them not be vulnerable. And you know that humans have this weird characteristic of wanting to learn the hard way. You question who is even wanting to read what you put out. Does anyone want to learn this? As Ronnell Richards says… then you get that #OneView. Behind the video views and comment counts, you connect with that one person that needed your message. And in a poetic way, kindness came full circle today to inspire me.